To make this masterpiece we combined Purple Heart, Olive Ash Burl, Bloodwood, Italian Ebony & an Aqua Dyed wood to make a unique masterpiece worthy frame. Fumed Oak and Aqua Dyed wood. This frame started on a Brown Base using Ebony Quarter sawn applied on angles in an A-Symmetrical application with Purple Heart and Blue Dyed Accents. Even one species of wood alone can be a masterpiece. This frame looks amazing on women with long blonde hair. Bloodwood with Tulipwood in the corners. The Satin Gold makes this frame just a little more elegant. We used Olive Ash Burl on the Face of the frame and complimented the Ziricote temples with more Olive Ash Burl and tiny strips of Bloodwood. Hand painted with oil paints by one of our in house artists. 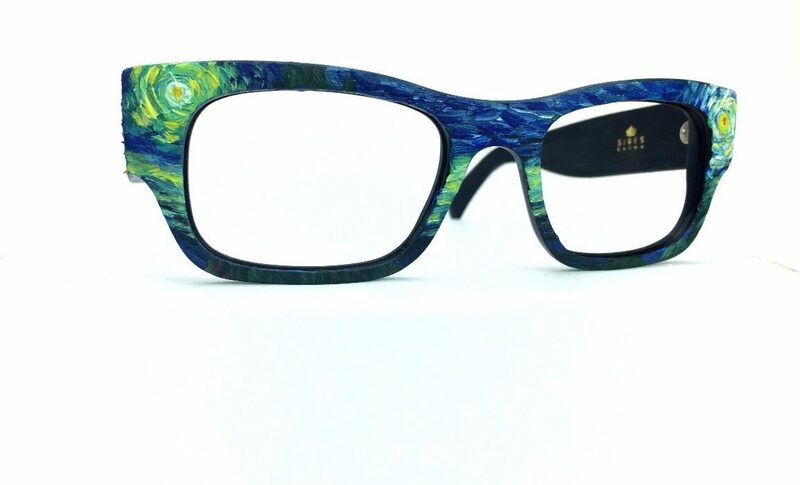 Inspired by 1960’s psychadelic Beatles tribute art with a recycled vinyl record on the face. Vinyl Record face with artwork inspired by album cover and vinyl record art. Fumed Oak with orange, red & white dyed wood accents. The artist was asked to paint this frame based on her interpretations of a book she read that was written by the author client. A recycled vinyl record on the face with Santos Rosewood used to build instruments on the temples. We combined a little bit of Bloodwood to accent and create a-symmetry with Ziricote hand cut on an angle. For all our music lovers, a frame made with recycled vinyl records. A-Symmetrical with more Bloodwood on one temple while the opposing temple has more Santos Rosewood. The A-Symmetry carried on to the face to unify the entire look. We hand cut and placed the lighter, quarter sawn Santos Rosewood in the corners and used the darker Santos Rosewood for the majority of the rest, seperated by subtle Bloodwood accents. Dillenia with Grey Oak corners. We placed the wood on angles using Tulipwood and Bloodwood. Ziricote using the blonde section of the tree too and Bloodwood corners. Vertical Italian Ebony with gold dyed wood accents.